08:30 Impact Hub. www.impacthub.net and Impact Hub King's Cross. 13:57 A tour with Maria Trindade, General Manager of Impact Hub King's Cross. 19:25 The story and ethos of Impact Hub. 21:20 A chat about the membership with Will Cardy, Communications Manager. 23:45 Letizia Custodero, Operations Manager, talks about the different events organised and hosted by Impact Hub King's Cross. 29:30 Pilar talks to one of the members, Luca Turconi, founder of Accelerance. Luca describes his organisation and shares how coming together for a couple of days has helped his global team. 41:10 The new Virtual, not Distant online course for managers and leaders of virtual teams. 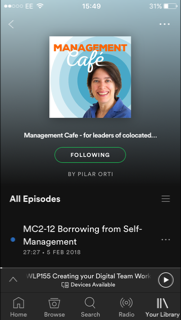 If you regularly listen to this podcast, you will know that every other week, I have virtual coffee with Lisette, and we talk about work practices in virtual teams and remote working. (If this is your first time listening, welcome!) And often when the term remote working comes up, many people think of it as working from home. So we’re either in the office, or we are at home. But we know that people work in cafes, although we might associate that more with freelancers, people work on trains, on planes, in airports and of course, there’s that 21st Century phenomenon, the co-working space. Co-working spaces are great, because they don’t just provide an affordable workspace (more of this lately) but they also provide a community. If you are a freelancer or an entrepreneur, you don’t need to sit at home on your own, or hire a room to house your desk. You can now look for the most convenient co-working space (of which there are many in the big cities) and you can have a space where you go in with your laptop, do your work and every now and then, turn round and chat to someone around you. If you think about motivation theories, many of them have an element of connection, relatedness, or social aspect to them. Deci and Ryan, for example, in their self-determination theory suggest that our motivation increases if we feel like we have a sense of autonomy, a feeling of competence and a sense of connection to others or another purpose. A co-working space takes care of this for freelancers, not just by placing other physical bodies around you, but often by sharing common values and organising events to build a sense of community. Interestingly, according to Deskmag’s annual Global Coworking Survey in 2012, which they sent to around 2000 participants of which just about half were freelancers, but also included small and big company employees, 71 percent of participants reported a boost in creativity since joining a coworking space, while 62 percent said their standard of work had improved. This just adds another alternative to flexible working. Flexible working is not always just the office, or the home, there can be other alternatives. Coworking spaces are also usually open beyond office hours, so that adds an element of flexibility to their members. More specifically, I am dedicating this episode to the Hub in King’s Cross, which is one of four London hubs. And, it’s where I’m based. It’s actually where I first gave my Virtual not Distant talk, as part of the lunchtime talks we used to have. And now Virtual not Distant is about to become an online course, a ten week programme to help you lead virtual teams. This was actually one of the first set of interviews I carried out back in October 2014 when I first started this podcast, in fact, before the podcast launched and, I have to say, the quality of the audio is not great, because I didn’t realise how much background noise my trusty Roland would pick up. So all the white noise which in a space, when you’re sitting there, just becomes a buzz of activity which helps you to concentrate, on a podcast is just too much. So that’s why it’s taken me quite a while to put this episode together. It’s also a little bit different to the other episodes where I have guests, as due to the sound quality, I’ve chopped the interviews, but I did get to talk to three of the Hub hosts. The hosts are the people in each Hub who look after the space, and, of course, who look after the members. And, to be honest, they are the reason why I’ve stayed at the Hub, because they make you feel like you really belong. To describe the Hub (and it’s funny, because it’s only recently that they changed their name to Impact Hub but it’s really difficult for me to get used to it, so I’ll apologies now, sorry, for still calling it the Hub… so, to describe this coworking space I’ll read a bit from their website, why paraphrase something which is so clear and succinct. “Located just steps away from King’s Cross station, we are a unique ecosystem of resources, inspiration, and collaboration opportunities that support a more sustainable world. The Impact Hub London community is made up of social businesses addressing challenges both locally and globally. Our members are entrepreneurs, social investors, freelancers, advocates, campaigners, creatives, artists, consultants, coaches and more. Our beautiful listed building is just one minute from King's Cross station. Members enjoy a global platform connecting you to 7000+ entrepreneurs, access to training and support, touchdown meeting spaces and hot desks; a flexible exhibition and events space; a fair-trade and organic cafe bar; and a programme of lectures, training workshops, debates and music. So, the first Impact Hub, which was known as The Hub for a very long while, was set up in 2004 by a group of graduates who couldn’t find a space to work on their projects, who wanted to work on social businesses and who were looking to be part of a different sort of capitalisms. I think that was just around the time too when Social Enterprises were replacing the more traditional companies and even charities, in the UK, at least that’s how I remembered it. A new business model was emerging which didn’t seek to make profit for profit’s sake but was looking to be as independent as possible, as sustainable as possible, by being able to invest any accountable profit back into the business. So after talking to some of the hosts, I thought it would be good to talk to someone else who was based there. The lovely Luca Turconi, founder of Accelerance offered to have a chat. Him and another of Accelerance’s people, Antoine Gerome are both based at the Hub, they’re there every day and always sit in the same place, upstairs. Accelerance is made up of a team of people who help organisations grow – they are part consultants- part coaches, facilitators… but I think I’ll let Luca tell you about who they are, he’ll be much more eloquent than myself. Just to let you know that we were in the coffee area and my recorder picks up a lot of background noise unfortunately, it’s designed to pick up voices equally, so it will feel a bit noisy at times. Anyway, here’s Luca. “We operate based on trust. What’s interesting for a company like Accelerance is that the Hub provides not just a space for Antoine and Luca to sit together but it’s also a space that their partners can use when they are in the city. They also use the meeting rooms when they need to have training together, meetings etc. Plus, they also tap into the Hub’s talent for help to grow the company, for marketing, social media, etc. One of the things that Luca said during our conversation, brings me back to what I was talking about at the beginning, that coworking spaces help fill the need for being physically close. It’s interesting, because I’m a great advocate for finding ways of working together when we’re not in the same physical space, and I think technology when used well, can really replace a lot of the traditional office space, but I’m not sure there’s ever going to be a replacement for sharing the same space, especially when being in a group. And this is specially important for teams of people who haven’t met each other in person before starting to work together, or becoming part of an organisation. So, Luca was telling me about a couple of days together the Accelerance partners had last year in Singapore, here he is again.